A dynamic team of US hip hop dancers will join forces with Hong Kong's Theatre of the Silence and energetic members of Youth Outreach to present a movement extravaganza combining dance, mime and physical theatre. Inspiringly, they seek to demonstrate that, despite differences in language, types of performance skills, cultural values and beliefs, art can prove a unifying force to help to build a harmonious world and celebrate the spirit of "One World One Dream". 'The word bonnes in French is ambiguous and offers an ironic word-play on its meanings of ‘good women’ and ‘maids’. Les Bonnes is a play about power, cruelty and human relationships. It asks its audience to think about their own ‘power’ relationships with others. This theme is so universal that audiences across the continents and across decades have profoundly inspired by it. Although the play focuses on the relationship between the two maids and their mistress (the Madame), it is far from a naturalistic play. Genet based the plot detail on a newspaper report from 1930s France, recounting the horrific murder of a family by twin sisters named Papin, who had worked for the family as maids without incident for years. Genet never forgot the story and reworked it for his first major play directed by Louis Jouvet in Paris in 1947. Jouvet insisted on using young female actresses (his current and former mistresses!) as the two maids for his own reasons, over-ruling the author’s preference that the maids should be played by male actors. Initial reaction was not very positive. To one aristocratic old lady who informed Genet that she generously gave her old dresses to her maid, the playwright caustically rejoined, “And does she give you hers?” Like other Genet plays, notably Les Paravents (The Screens), Les Bonnes enjoyed something of a success de scandale, (being heavily censored in other cities like London) but Genet himself, always one to enjoy controversy, didn’t like Jouvet’s version and lost interest in the play’s after-life. He did however produce a guide to the performance of his drama entitled “How to Play Les Bonnes” which is included in the Gallimard edition and is highly illumination. Two things stood out for us – one being the emphasis on the maids’ ‘furtive’ body language, and the other the observation that the objects on stage seem to conspire against the maids to wreck their hopes of emancipation and empowerment. For Genet, as he explained in his foreward to Les Bonnes, theatre was much more than a description of everyday language and gestures: rather it represented an act of liberation from everyday reality. There is no greater index of character as sure as the voice. But a voice is not to be raised, for we cannot learn from one another until we stop shouting. So here we speak, quietly, so that our words can be heard as well as our voices. An old sailor reaches agreement with his lover in Hotel Hollywood to meet, Late comes he has been waited for with hardship opposite party 25 years. Lived in this grotesque and gaudy hotel fills has come from all quarters resident, in this one day which met again to the lover, The hotel has transmitted the reconstruction news, actually this hotel and does all residents water transport meet can how? Loung Ung emmigrated to the U.S. from Cambodia at age ten, in l980. “First They Killed My Father”, her best-selling childhood memoir of life and death under the Khmer Rouge, was published in 2000. She is presently National Spokesperson for the Campaign for a Landmine-Free World, a project of the Vietnam Veterans of America. The civil wars and genocide that racked Cambodia in the l970s and 80's were unintended consequences of the U.S. war in Vietnam. Until 1970, Cambodia’s Prince Sihanouk kept his country neutral while "Khmer Rouge" led an insurgency which had few followers. Though Vietnam and Cambodia were traditional enemies, Sihanouk turned a blind eye to North Vietnamese and Vietcong troop movements inside his borders. In 1970, U.S. National Security Advisor Henry Kissinger counseled President Nixon to bomb the enemy inside Cambodia. Between l970 and l973, U.S. planes dropped 540,000 tons of bombs on Cambodia. Sihanouk was deposed by his top General, Lon Nol; Cambodia entered the war on the U.S. side, and displaced peasants flocked to the Khmer Rouge. Our play begins just before the final Khmer Rouge victory in April, 1975, two weeks before the Communist victory in Vietnam. Directed by Dan Chumley, former Artistic Director of San Francisco Mime Troupe, and adapted by Joan Holden, “My Red Dress” was premiered at 2004 Faust Festival. Before the second run in Hong Kong, “My Red Dress” will be staged at the Asian Women Theatre Conference, Shanghai, PRC and the 2005 Gwangju Asian Madang, South Korea. 11/2004 Macau Fringe 2004 "The Monkey's Paw"
A Journey into the World of Visual Wonders A light fast-paced narrative embraces the cinematic nature of Sign language, movement and mime. Theatre of the Silence lends its physicality and inventiveness to the play. The Monkey's Paw A soldier friend of the family divulges a horrendous secret about the fortunes and evils of the monkey's paw he has unwittingly acquired while visiting India. The civil wars and genocide that racked Cambodia in the 1980's were unintended consequences of the U.S. war in Vietnam. Until 1970, Cambodia's Prince Sihanouk kept his country neutral while the United States based troops in Thailand and funded anticommunist guerillas in Laos. "Khmer Rouge" (Cambodian Reds) was Sihanouk's name for the Maoist insurgency led by Saloth Sar (Pol Pot), which had few followers in a country where 90% of peasants owned land. Though Vietnam and Cambodia were traditional enemies, Sihanouk turned a blind eye to North Vietnamese and Vietcong troop movements inside his borders. In 1970, U.S. National Security Advisor Henry Kissinger counseled President Nixon to bomb the enemy inside Cambodia. Between 1970 and 1973, when Congress halted the bombing, U.S. B-52's dropped 540,000 tons of bombs on Cambodia. Sihanouk was deposed by his top General, Lon No. I; Cambodia entered the war on the U.S. side, and displaced peasants flocked to the Khmer Rouge. Our play begins just before the final Khmer Rouge victory in April, 1975, two weeks before the Communist victory in Vietnam. Broken, ripped and unwanted, the toys only destiny is to remain in a dirty garbage can, forever forgotten. A clown puppet with a special gift is given a chance to change that destiny, to find a new world for him and the other toys. As he journeys into the human world, dangers and misfortunes unfold. Will he be able to find a place to call their own? 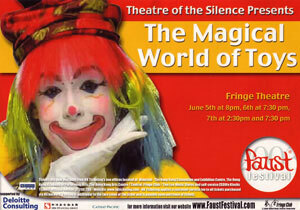 Join the clown on his special journey, that will bring tears and laughter, and spread tenderness and joy. Don't miss it! After a series of misfortunes, in Hong Kong a woman and her baby set out on a long sea journey in search of a distant aunt. All she has is a Tin Hau statue, a compass and her hopes and superstitions. Are they enough for the dangers that lie in the journey? Let us confront our collective consciousness of the citystate at this moment, use the past to deal with the future. A language barrier-free performance of movement, music and comedy by the masters of visual and physical theatre, provoking laughter, tears and thoughts. The story is about two young people falsely accused of murder by excitable villagers protest their innocence to officials who value order above truth and their comfort above their consciences. An intelligent magistrate discovers the real murderer and saves the two from the executioners' sword. Our adaptation adds a twist to the happy ending. A 40-year old woman is quietly waitng in a passenger lounge for her plane. Suddenly, an attendant drags in four black boxes, filling the room with excitement. In her panic, memories of the woman's previous love affairs with four men and their dogs-Master Beijing, Uncle Taipei, Prince Tokyo and Hongkonger flash through her mind. She is transported in the memories of her four affairs, and her encounter and involvement with the four dogs. The four boxes seem to be loaded with secrets, pointing to four different paths of life. With four dogs, four personalities and four distinctive "love" stories, the farce begins and ends in absurdity.